Operational decisions in the day-to-day business of chemical production processes can have a significant impact on the energy and material efficiency. 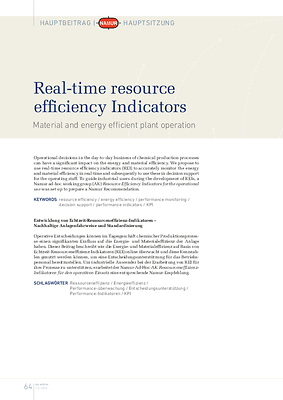 We propose to use real-time resource efficiency indicators (REI) to accurately monitor the energy and material efficiency in real-time and subsequently to use these in decision support for the operating staff. To guide industrial users during the development of REIs, a Namur ad-hoc working group (AK) Resource Efficiency Indicators for the operational use was set up to prepare a Namur Recommendation.